There is ample evidence to suggest that leading Republican members of the House and Senate are a good deal more familiar with the fiction of Ayn Rand than with the self-evident truths of Thomas Jefferson, James Madison or Abraham Lincoln. But it is now safe to say that no congressional Republican is more in the thrall of Rand than Wisconsin Senator Ron Johnson. The Tea Party favorite who came into the limelight last week, first with his convoluted questioning of Secretary of State Hillary Clinton about the tragic killings of Americans at Benghazi in Libya, and then with his acknowledgement after a dressing down from secretary of state nominee John Kerry that he had not actually been a member of the committee when some of the basic briefings on Benghazi were presented. While Johnson may not be prepared for Senate Foreign Relations Committee hearings, he’s entirely up to speed on Ayn Rand and Atlas Shrugged. Never mind that Whittaker Chambers—no liberal he—famously dismissed the book with an assessment for The National Review that declared: "Out of a lifetime of reading, I can recall no other book in which a tone of overriding arrogance was so implacably sustained. Its shrillness is without reprieve. Its dogmatism is without appeal." 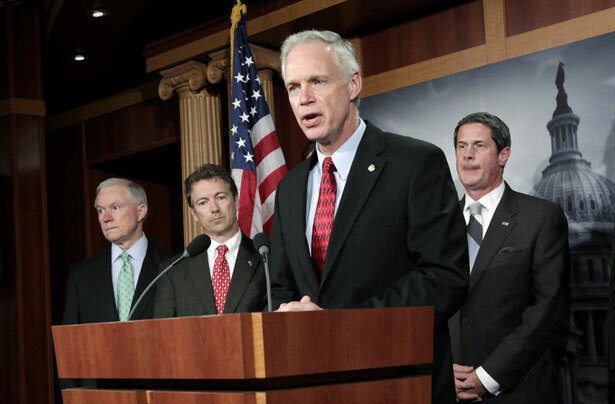 As far as Ron Johnson is concerned, Atlas Shrugged contains 1,168 pages of life lessons. Before his election to the Senate, Johnson helped purchase and erect a statue honoring the book. And in a newly produced video he tells an interviewer that he thinks we’re living in an Ayn Rand moment and that he’s a lot like one of the characters from Atlas Shrugged. “Ayn Rand wrote Atlas Shrugged in 1957, partly as a warning against the growth of government. Do you see parallels between the plot of Atlas Shrugged and current events?” asks Laurie Rice of the Rand-focused Atlas Society in the interview. Then Johnson goes all in, finding something of himself in a favorite Ayn Rand novel. That’s the sort of confidence you’d expect from a senator who boldly interrogated the Secretary of State without bothering to prepare. Rick Perlstein criticizes another Ayn Rand–inspired Republican fantasy: turning Detroit’s main park into a sovereign nation with a $300,000 citizenship fee.